I’m baaaack! After a few months’ hiatus, I’m ready to recommit to the Low-Carb Lifestyle and start sharing recipes again. I thought I’d start easy this week and do some quick-fix (or fix-ahead) dishes that make low-carbing easier with a busy lifestyle. And since I do eat out a couple of times every week, I’ll also share my strategies for sticking to what’s approximately an Atkins Phase 1 daily carb limit level (Atkins is a strict 20 net grams; I’ll stick to a range of 20-40 net grams daily). Preheat oven to 400°F. Cover a baking sheet with aluminum foil; lightly coat foil with olive oil or spray with non-stick cooking spray. 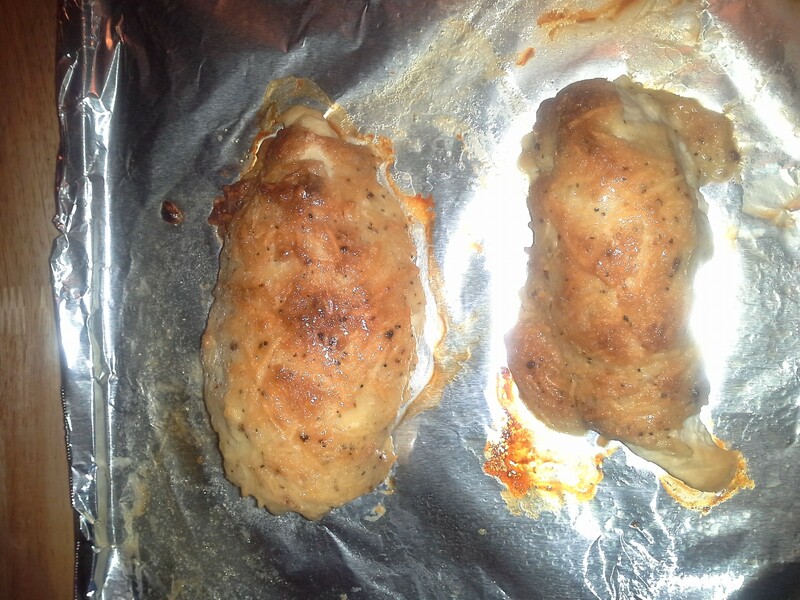 Pat chicken breasts dry and place on greased baking sheet so that they are not touching. In a small bowl, combine mayo, cheese, and seasoning. Mix well. 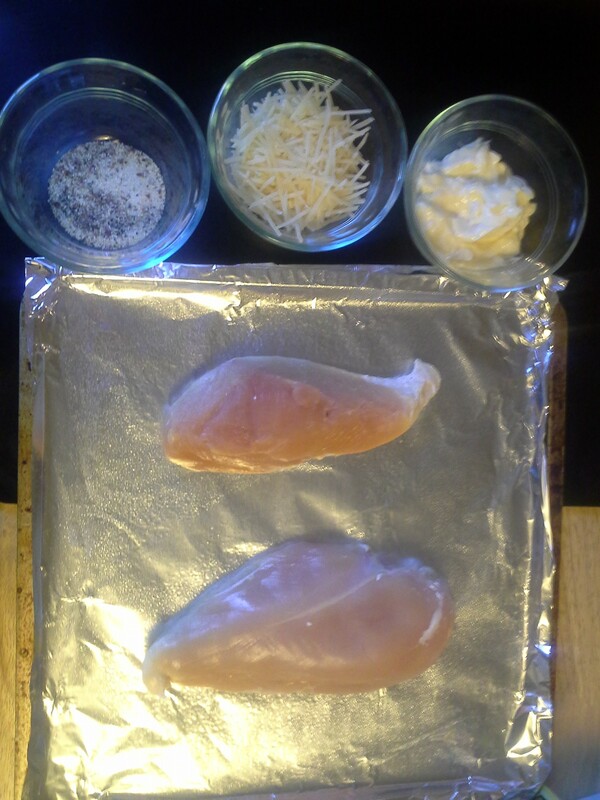 Smear each piece of chicken with half the mayo-cheese mixture. Bake approximately 30 minutes or until chicken is cooked through and juices run clear. Let sit at least 5 minutes to allow the cheese on top to cool into a crust. *One of the recipes I saw online used 2 tsp. of chili powder to give the chicken a kick. Salt and black pepper might need to be added if using a seasoning that does not include them—however, keep in mind that the parmesan will add saltiness to it on its own. Are you counting one breast as a serving or both breasts? How big are the breasts? I’ve made a similar recipe but instead of the dry seasoning mine uses Italian bread crumbs. I like the idea of using the seasoning to make it lower carb. Yes, each breast is one serving. The calculations (from FitDay.com) are based on an 8-ounce pre-cooking weight boneless, skinless breast portion.